AirPods are set to go on sale at Apple Stores next week, after launching sales online yesterday (which are now backlogged six weeks). If you want to stay on top of whether your local store has stock, you could just call in and ask. But honestly—‘ain’t nobody got time for dat’ in 2016, which is why iStockNow, the popular iPhone status checker, was updated to add AirPods to the list. Now you can get real-time AirPods stock data, refreshed every minute, according to the developers. 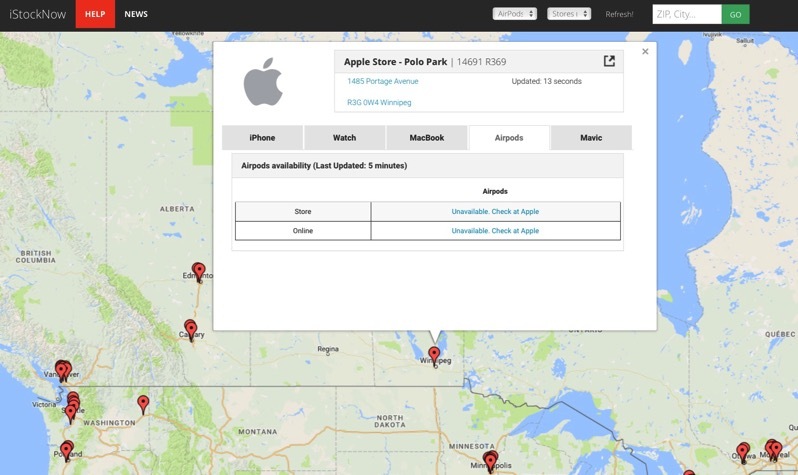 The site also supports Apple Stores in Canada, on top of locations in the USA. If you see green, that’s a sign the item you’re looking for is in stock. Right now, for the most part, Apple Stores coast-to-coast have every iPhone model configuration available. Yes, this means Jet Black iPhone 7 and iPhone 7 Plus models, too. iStockNow also recently added a stock checker for the new DJI Mavic Pro drone as well, to join 2016 MacBook Pro models with and without Touch Bar.